Throwback Thursday: Where Did The Hanukkah Bush Come From? The holiday season truly is the most wonderful time of the year. We’re surrounded by fresh snow, colorful lights, and, of course, radio stations that play Christmas music 24/7. Chicagoans like myself tune into 93.9 My FM for the best holiday jams while we sit in holiday traffic. 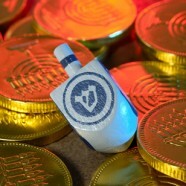 I’d like to take a moment to make a request: can we throw in a Hanukkah song once in a while? I’ll settle for once every eight hours. After all, those Jewish boys and girls can use a little pick-me-up after the first night of Hanukkah got trampled by Thanksgiving this year. We just want a little time alone in the spotlight—well, candlelight. You might be thinking, “No one wants to listen to ‘I Have a Little Dreidel’ on repeat.” I agree. But Hanukkah music has been slowly getting a pop culture makeover. We may not have legends like Bing Crosby or Mariah Carey singing about potato latkes, but we’ve got a foot in the door. Today I invite you to take a gander at some enjoyable Hanukkah songs that hopefully will one day spin dreidels and DJ records alike. Adam Sandler’s “The Hanukkah Song” is the most well-known of the bunch. It’s as funny as it is comforting. Sandler reminds us Jewish kids of all the successful celebrities that light the Menorah. It also reminds us that OJ Simpson doesn’t observe Hanukkah, which is equally satisfying. Peter, Paul, and Mary mostly apply to an older generation, but their composition of “Light One Candle” sure does have a touching side. They tie in the historical importance of Hanukkah with modern times. You’ve got to give it up for anyone that finds a way to reference the Maccabee children. Stand Four needs only their voices to create the smooth Hanukkah melody of “Eight Nights.” The popular tune of “Some Nights” in a cappella form might overshadow just how informative this song really is. If you’re unsure of why we celebrate Hanukkah and what it symbolizes, get ready to learn. Matt is a Junior Executive at SJG. He graduated from DePauw University with a BA in communications. He hopes to one day become knowledgeable in enough areas to compete in a TV trivia game show with huge cash prizes. In his free time, he enjoys traveling, writing, comedy, photography, and asserting alpha male behavior on the basketball court.